If you haven’t played with tarot cards, you have a treat in store. The cards will enhance your creativity and will teach you about yourself. In essence, the cards give you a compass so you can navigate the deep waters of your subconscious mind. You can buy a tarot deck almost anywhere. Try your local bookstore, or a specialty or gift shop. If you can’t find cards locally, you can buy them online. Get to know the cards by using your tarot deck as a relaxation tool. 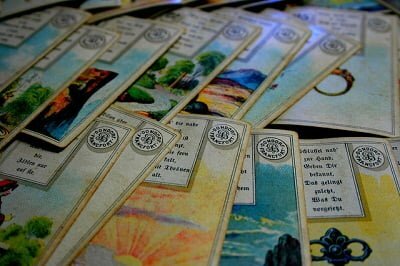 Using your cards as a relaxation aid is the fastest and easiest way to use their ability to enhance your creativity. This is because the key to creativity is communication between your conscious and subconscious minds, and between your logical left brain, and your holistic right brain. This happens most effectively when you’re relaxed, or asleep. (Try the right left brain test). Information tends to bubble up from your subconscious mind when you combine relaxation and a repetitive simple activity. Many artists and writers find that their best ideas come to them when they’re driving, or gardening, or taking a shower, for example. They relax, their conscious mind is engaged with the repetitive activity, and ideas arrive, bubbling up from the subconscious. Take your cards out of their box, and sit in a comfortable chair. Make sure that you have adequate light so you can see the cards clearly. Take a couple of deep breaths. Hold each breath for a moment, and then exhale. Close your eyes, and scan your body. Can you feel tension anywhere, such as in your shoulders, or between your eyebrows? Consciously relax those areas of your body. Feel as if you’re standing under a warm shower of spring rain, and the rain is washing the tension completely out of your body. Open your eyes and stretch. Take the cards one by one, and just look at them in a relaxed way. The key here is not to strain. Enjoy the process. Try to recapture the feeling you had as a child when you paged through a picture book. Look at a tarot card for as long as you wish, then move on to the next. If any strong emotion comes up, don’t try to repress it, whatever it is. On the other hand, don’t cling to the emotion either. Take a couple of deep breaths, and go on to the next card. How long should this relaxation process take? Anywhere from three to 15 minutes. Keep a notebook handy when you relax with your cards. When you use the relaxation process (you can use it several times a day if you wish) you’ll often find that you get inspired. Ideas which come up for you may be related to your primary concern, such as a project you’re working on, or to a relationship problem, or to a new way you could approach a task. Or they may seem to come out of nowhere at all. In order not lose your ideas, keep a notebook or a tape recorder handy. You’ll find that if you don’t make a note of these ideas, they’ll vanish. They tend to be as ephemeral as dreams. Even if you’re sure that the idea you just had is so brilliant that there’s no way you’ll forget it, write it down.